Asset Alliance Group has upgraded John McNally Haulage’s fleet by replacing the majority of the company’s owned vehicles with new, high spec Mercedes-Benz trucks. Finance specialist Asset Alliance has supplied the Lanarkshire-based haulier with eight Actros 510 6×2 GigaSpace tractors on a three-year full service contract hire agreement, while its sister company ATE Truck and Trailer Sales bought six of its used units. 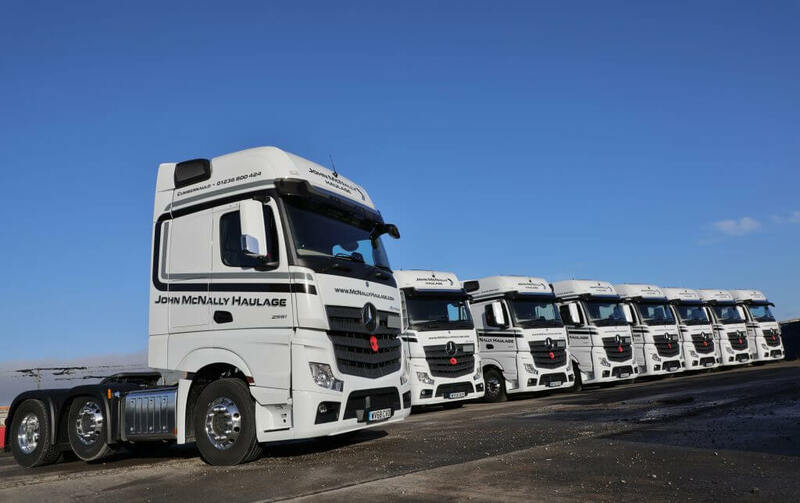 John McNally, owner of John McNally Haulage, says: “Updating our fleet with Asset Alliance Group has been quick and simple, and really refreshing. They sourced and supplied the new trucks we wanted without any fuss and gave us a competitive price for our used vehicles. John McNally Haulage will benefit from full repair and maintenance support, which includes all safety inspections, maintenance, servicing and repairs required in one monthly payment. Asset Alliance Group has also organised driver training from Mercedes-Benz for John McNally Haulage staff to ensure the new Euro 6 tractor units are operated as efficiently as possible, reducing fuel consumption and minimising emissions. McNally adds: “Reliability and uptime are major factors in our business contracts and we’re confident Asset Alliance Group understand our needs. The new tractor units will be used on John McNally Haulage’s main contract with P&O Ferrymasters, transporting general haulage items in and out of the ports of Hull, Immingham, Liverpool and Teesport, and for distributing goods all over the UK. John McNally Haulage is a family-run business, based in Cumbernauld, North Lanarkshire. It has been in operation since 2005 and delivers throughout the UK. Asset Alliance Group retains top Finance Provider title at prestigious Commercial Motor AwardsPositive thoughts about 2019!